This expanded program will offer ten roundtrip sailings departing Vancouver, ranging from nine to twelve nights, plus one cruise to San Francisco including an overnight stay on Independence Day. 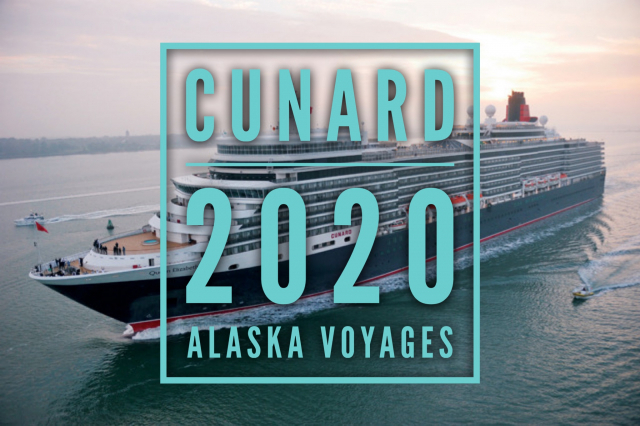 Each Alaska voyage will feature destinations along the Northwest Pacific coast of Alaska and British Columbia including Skagway, Juneau, Ketchikan, Sitka, and more. In addition, the voyages offer more than 120 excursions to choose from including scenic cruising in the narrow waterways of the Inside Passage, the Hubbard Glacier, and Sawyer Glacier’s twin fjords, Tracy Arm and Endicott Arm. Cunard continues its partnership with Rocky Mountaineer, offering pre- and post-cruise tours on the railroad. Tours include either three or five nights’ accommodation and two full days on board the train. The expedition travels through an array of scenery with glacier and snow-capped peaks of the Canadian Rockies, through river canyons, mountain passes, and tunnels. Highlights include the Continental Divide, Kicking Horse Canyon, Spiral Tunnels, and the rushing waters of Hell’s Gate in the Fraser Canyon. Guests will enjoy these itineraries onboard Queen Elizabeth, the youngest ship in the fleet, which has just been refurbished. This included a new spa concept: Mareel Wellness and Beauty, developed in partnership with Canyon Ranch. The spa offers a new treatment menu with mineral-rich seawater and marine-based experiences as well as a redesign of the entire spa facility. In addition, many public spaces, bars, and lounges have been updated and all Grill Suites and Britannia Staterooms have new carpets and soft furnishings. The Royal Court Theatre had a complete technical overhaul; the Royal Arcade has been enhanced and the outdoor decks have new furniture with a new layout on the Sun Deck.